With persecution of Christians around the world as severe and as public as it is today, is your church praying for our brothers and sisters in Christ? If not, please consider asking your church to spread the word and pray often for those suffering for bearing the great name of Jesus Christ. -W.E. 1) convert to Islam or 2) pay jizya (tribute or extortion money, as in the Koran 9:29) and uphold all the conditions stipulated in the medieval Conditions of Omar—which include heavy restrictions on Christian worship—or 3) the sword. citing the Islamic concept of “dhimma”, [which] requires Christians in the city to pay tax of around half an ounce (14g) of pure gold in exchange for their safety. It says Christians must not make renovations to churches, display crosses or other religious symbols outside churches, ring church bells or pray in public. 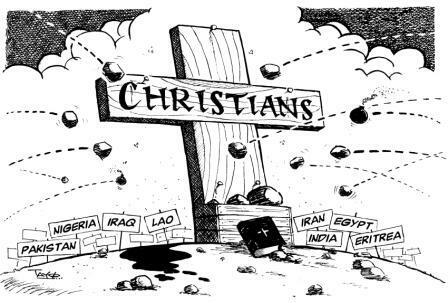 Christians must not carry arms, and must follow other rules imposed by ISIS (also known as ISIL) on their daily lives. The statement said the group had met Christian representatives and offered them three choices—they could convert to Islam, accept ISIS’ conditions, or reject their control and risk being killed. “If they reject, they are subject to being legitimate targets, and nothing will remain between them and ISIS other than the sword,” the statement said. theme and country in alphabetical order, not necessarily according to severity. Libya: After Ansar al-Sharia—a group that appears connected to Egypt’s now ousted Muslim Brotherhood—offered a reward to any Benghazi resident who helped round up and execute the nation’s Coptic Christian residents, seven Copts were identified as Christians, forcibly seized from their homes by “unknown gunmen,” taken out and executed some 20 miles west of Benghazi (graphic pictures appear here). A few days later, another Coptic Christian, Salama Fawzi, 24, was shot in the head — again by several “unknown gunmen” — while unloading food in front of his grocery stand in Benghazi. The day after that, another corpse was found, believed — from the small cross tattooed on his wrist traditionally worn by Egyptian Christians — to be that of a Copt. 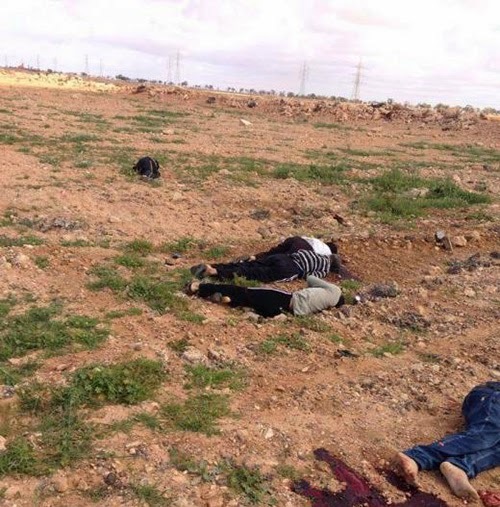 Bodies of Coptic Christians lay in a field near Benghazi, Libya, after their abduction and execution by Islamists in February. Also, in the Indonesian province of Aceh, a new law appeared saying that Islamic laws (Sharia) be extended to non-Muslims, the majority of whom are Christian. Elements of Sharia had already been in force but were applied only to Muslims. The new by-law [Qanun Jinayat] was approved by Aceh’s legislative council and signed by Governor Zaini Abdullah, who said “The qanun [law] does indeed oblige everyone in Aceh to follow sharia without exception. It would be unfair if Muslims were punished while non-Muslims were not, just because sharia violations are not stipulated in the Criminal Code.” Since then, non-Muslim women have been harassed by police for not wearing veils, and men for wearing shorts. Three-time violators of the dress rules could be publicly caned. years. Due to several estate policies, “almost all of the lands sold during those years increased from Christian owners to Muslim owners. developed to collate some—by no means all—of the instances of persecution that surface each month. It documents what the mainstream media often fails to report. It posits that such persecution is not random but systematic, and takes place in all languages ethnicities and locations.